Indian cricket team captain Virat Kohli has been named as the Wisden's Leading Cricketer of the Year. Kohli wins this award for the third time in a row. Apart from Kohli, India’s Smriti Mandhana has been named the leading woman cricketer in the world. These and other awards were announced during the release of the 156th edition of the Wisden Cricketers' Almanack on Wednesday, April 10. KWK Controversy: Decision on Hardik Pandya and KL Rahul in Due Course, Says BCCI Ombudsman DK Jain. Kohli, who appeared on the cover in the 2017 edition of the Almanack, had a productive tour of England in 2018 as a batsman. Despite, India losing the Test series 1-4, Kohli performance was outstanding. “Despite finishing on the losing side, India captain Virat Kohli shone with the bat, laying to rest his struggles in England in 2014 by scoring a magnificent 593 runs in five Tests, a full 244 more than his nearest rival on either side," Almanack said. “Virat Kohli wins [Leading Cricketer of the Year] for an unprecedented third year in a row, scoring 2,735 runs across the international formats – more than 700 clear of Joe Root in second place. His Test batting, especially in England, was magnificent, while his 50-over form moved to a new level – if that was possible,” it added. Enough of Funny RCB Memes! An Open Letter to Virat Kohli Haters From Royal Challengers Bangalore Fan. Mandhana has been the leading scoring in women's one-day internationals and Twenty20 Internationals since the start of 2018 and thus takes the women’s award. Meanwhile, Afghanistan’s spin sensation Rashid Khan was named as leading T20 Cricketer of the Year for the second year in a row. 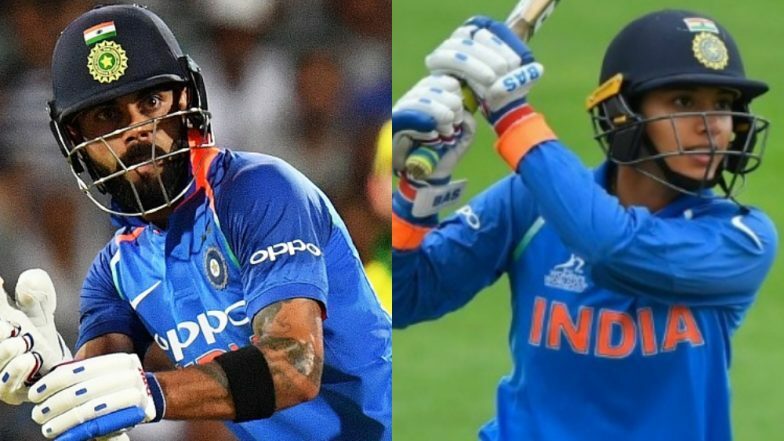 Apart from being chosen as leading Cricketer of the Year, Kohli was also named as one of the five cricketers of the year along with Tammy Beaumont, Rory Burns, Jos Buttler, and Sam Curran.